When the governor of Alaska walks into a room, every long lens, television camera and microphone is pointed in her direction. An observer of the jostling and yelling of the US media might be mistaken for thinking that a major film star had just strolled in, complete with a posse of hangers-on. Even at the best of times it is hard to see the diminutive star of the Republican Party when she is surrounded by journalists desperate to know of her plans for the next few years. There is little doubt that at this year's convention of the Republican Governors Association, being held in Miami, Sarah Palin, not long ago the party's candidate for vice-president of the US, in firmly in the spotlight - for now. Addressing her fellow Republican governors on Thursday, Sarah Palin was in jovial and relaxed form as she summed up her recent activities. "Let's see, I had a baby, I did some travelling. I very briefly expanded my wardrobe," she said, referring to the controversy over her $150,000 budget for campaign clothes. "I made a few speeches, met a few VIPs, including those who really impact society like [Saturday Night Live comedian] Tina Fey. Aside from that, it was pretty much same old, same old." The speech was aired live by three major American TV networks. The press conference beforehand, during which Mrs Palin only answered four questions before another governor brought the proceedings to a halt, was not. But this was a politician on message. There were no subtle hints about her future plans, only talk of how to get the Republicans back into power. After all, this conference is essentially a post-mortem session by the governors of a party now in the minority. "We want to reach out to the new administration and offer our assistance, our support, offer solutions and I think that we'll be sought by the new administration, by Congress, and we're here to help," Mrs Palin insisted. So there was a conciliatory tone from John McCain's former running mate, but one in stark contrast to her recent TV appearances. Sarah Palin has been on almost every major network in the US, allowing the cameras into her home and family life. She has used those appearances in part to defend herself against the anonymous McCain staffers who accused her of being ill-prepared and ill-tempered. She has also hinted at her own ambitions to become the first female president. But Sarah Palin faces some tough competition. She may be getting all the attention now, but there are other young Republican stars waiting in the wings. Governors Tim Pawlenty of Minnesota, Bobby Jindal of Louisiana and Florida's own Charlie Crist are all being touted as potential future leaders. 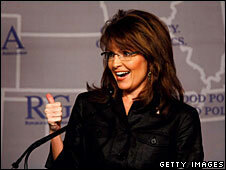 At this years' convention all of them have been sidelined by the seemingly unstoppable Sarah Palin. When she finished speaking at the conference many of the television crews and photographers rushed from the room to file their "Palin" footage. But in the future, Alaska's governor may not be getting all the attention. Lots of energy, but how effective has policy been?